Below you will find an older version of the learning goals used in Cubes and Liquids. You can find a more up to date version HERE. Does the learner faithfully depict what they observe or do they contaminate their observation with assumptions, inferences, and explanations? Do they conclude (unjustifiably) that a cube was placed in a beaker of water, or are they careful (and true to their observation) in specifying that the cube was placed in a beaker of liquid. Does the learner describe the events that transpired in an experiment in such a way that a person who was not present to observe the experiment can re-construct the salient elements sufficiently to repeat what occurred? In this case the salient elements are all those that might be related to understanding why specified cubes are or are not floating in specified liquids. Does the learner coordinate the mass and volume of solid objects? Do they understand that when an object sinks, that another object of equal weight and smaller size will also sink int hat liquid? Do they know when there is insufficient information concerning the relationship of the density of a solid object to the density of a liquid which it is immersed to make a valid prediction? If so, it is because they are coordinating the mass and volume of the solid object. 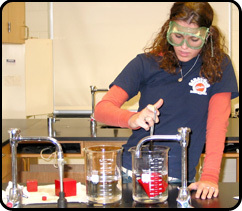 Does the learner coordinate the mass and volume of liquids? Can they take a situation in which they have been given the mass and volume of a cube (say 2 cc’s and 1 gram) and describe the properties of liquids in which that cube would float? Can they do so without using the word density? To solve this they must decompose a quantity of water into its mass and volume and describe the relationship between them. Does the learner coordinate solid and liquid densities? In this Activity, they are given the mass and volume of a cube. They are asked to describe the properties of a liquid such that the cube would float in it. They are not permitted to use the word ‘density’ in their answer. Their answer to this question reveals that extent to which they are able to form ratios (mass/volume of solid and mass/volume of liquid) and to competently compare these ratios to solve the problem.